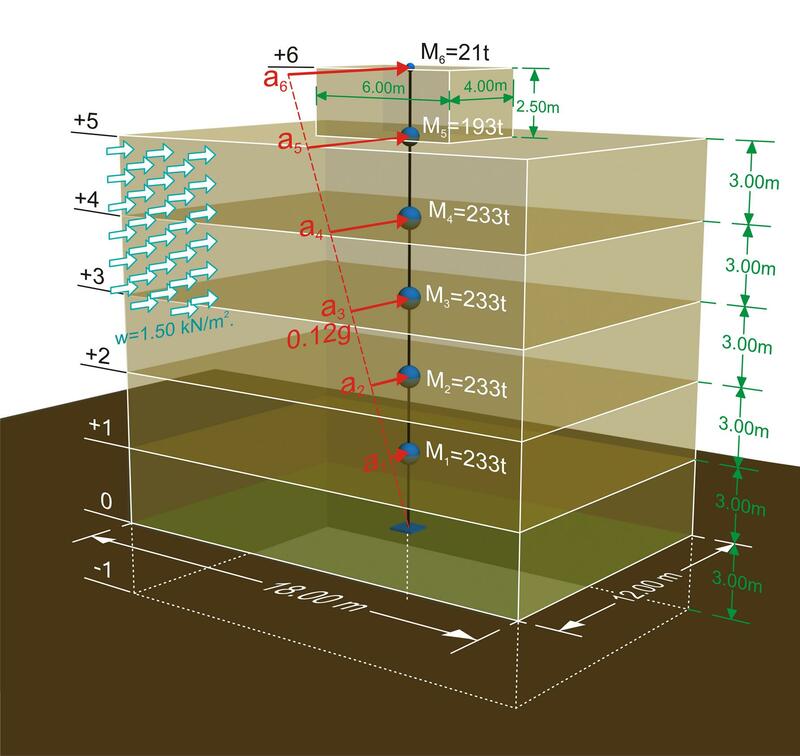 The residential building of the sketch includes a basement of area 12x18 m2 and height 3 m, a ground floor and four storeys of identical dimensions and a top floor of area 4x6 m2 and height 2.5 m. The masses at levels 0, 1, 2, 3, 4 are equal to MG=220 t and MQ=44 t, at level 5 to MG=180 t and MQ=44 t, while at the top level to MG=20 t and MQ =4 t.
The building is situated in the seismic area Z1 and the distribution of seismic accelerations is triangular. The design seismic acceleration of magnitude 0.12g is applied at the center of mass of the building. The calculation of the seismic and wind forces as well as a comparison between them is asked. Since the building is residential ψ2=0.30 and consequently during an earthquake the dynamic masses are evaluated asM=MG+0.30·MQ. Thus, the dynamic masses at levels 0, 1, 2, 3 and 4 are equal to M G+0.30Q,i=0-4=220+0.30x44=233 t, at level 5 is equal to MG+0.30Q,5=180+0.30x44=193 t, while at the top level is equal MG+0.30Q,6=20+0.30x4=21 t.
Figure 2.5-2: Wind forces Fw are less significant comparing to earthquake forces Fs. a 2 =0.08g , a3=0.12g, a4=0.16g, a5=0.20g and a6 =0.24g. The total seismic force (or the total seismic base shear force) Fs,tot is equal to the sum seismic forces at different levels and its center of application is located at about 2/3 of the building height. while on the top floor is Fw=6.0m·2.5m·1.50kN/m2=23 kN. The total wind force is Nw,tot=12+52+4x81=388 kN and its point of application is located at about 1/2 of the building height. Wind forces represent 388/1349=29% of the seismic forces and their CM is at (1/2)/(2/3)=75% of the CM of seismic forces. Consequently the seismic forces are of much greater value as well as importance than the wind forces. [*] NoteTheoretically the less significant seismic forces could result in seismic area Ζ1 in soil type Α (S=1.0) with γI=1.0 and q=6.75. The interval 0.15≤T≤0.50 gives spectral acceleration Sd=γI*agR*S*2.5/q=0.16g*2.5/6.75=0.059g → Fs,tot=1146t*(0.059x9.81)m/sec2=663kN.Theoretically the most critical rectangular building plan of area 12x18=216 m2 with respect to wind forces is the one with sides aspect ratio 1/4 [EC8 4.2.3.2(5)], resulting to plan dimensions 30x7.2 approximately. The wind force for the side of 30 m width, is Fw=30.0x3.0x1.50=135 kN for each storey while at the top floor remains Fw=6.0x2.5x1.50=22.5 kN. 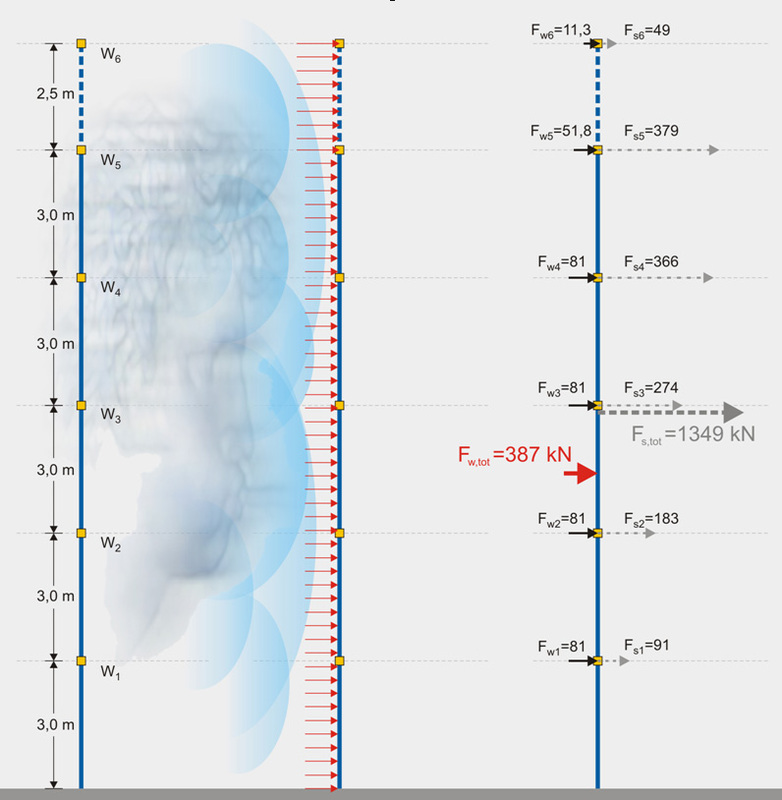 Therefore the wind load at the 6th level is Fw,6=22.5/2=11 kN, at the 5th level Fw,5=22.5/2+135/2=79 kN, while at the rest Fw,i=135/2+135/2=135 kN. The total wind force is Fw,tot=11+79+4x135=630 kN. .